HRD Minister Smriti Irani expressed shock in Parliament at anyone describing Durga as a goddess who “entices” Mahishasur, a “brave, self-respecting leader”. It’s true that we have never celebrated Durga Puja,” says Chamru Asur. 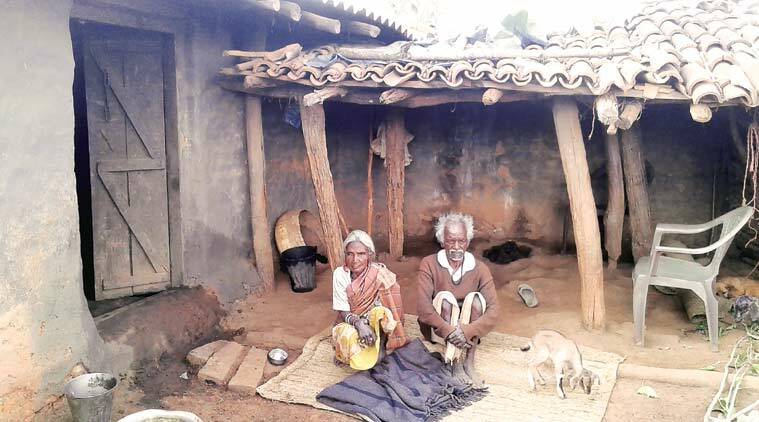 “It is also true that we remain inactive during those nine days and, at the end of it, make offerings to our ancestors so that we are all safe,” says the 70-year-old at his home in Sakhuapani, a village 500 metres from the Hindalco Group’s Gurdari bauxite mine in Gumla district of Jharkhand. As he speaks about his traditions and way of life, Chamru is almost passive — not apologetic, not defensive, not angry, not seeking answers. Chamru is an Asur, a ‘particularly vulnerable tribal group’ that dominates Sakhuapani’s population of about 2,000 and lives in villages spread over a radius of 10 to 20 km. 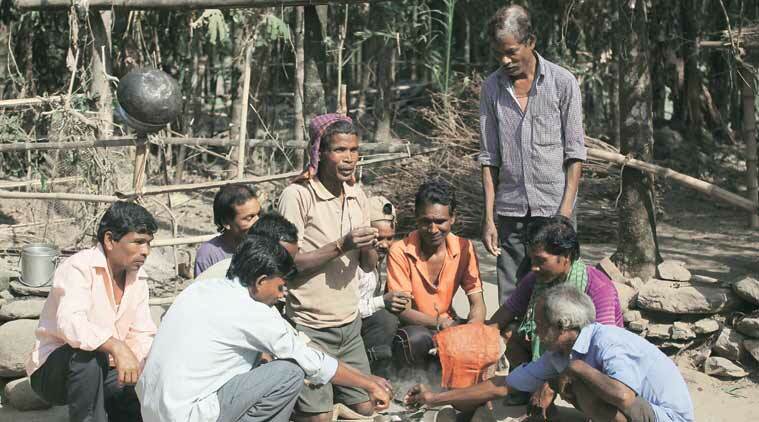 Besides Jharkhand, members of the tribe live in pockets of Bihar, West Bengal and a few other states. The 2011 Census put the number of Asurs at 22,459 in Jharkhand and 4,129 in Bihar. The Asurs claim to be descendants of Mahishasur, the buffalo-demon whom Goddess Durga kills after a spirited fight lasting nine nights. It’s this mythology in mainstream Hinduism that’s celebrated in the form of the nine-day-long Durga Puja, but observed as ‘Mahishasur Dasain’ among the Asurs, who hold a period of mourning during which they largely stay indoors. Chamru says that even when he was a child, though people had their beliefs and biases, nobody attacked them for it, they merely thought they were different. “Those were the days of zamindari. The zamindar of Bishunpur (now the local police station) would ask us to get wood and collect leaves for making pattals for the puja. We would go there, give the zamindar all this and also give him some of our tools. We would then return home before the celebrations began and offer prayers seeking protection from our own ancestors,” says Chamru. Now as these cultures are seen as offending, Chamru says these are “just beliefs”. “I have heard we are descendants of Mahishasur. That’s all I can tell you. I can’t tell you how our descendants settled down in this part of the country and so on,” he says. Sushma Asur, a tribal activist in Sakhuapani, says the community also celebrates Sohrai, which coincides with Diwali, by applying koronj (or karanja in Hindi) oil on their navel, chest and nose, and eat cucumber. “The symbolism here is that when our ancestor Mahishasur was killed, he had blood oozing from his navel, nose and chest. Applying oil on those parts depicts the same. Eating cucumber is a symbol that we are avenging his death by eating the ‘kaleja (liver)’ of the killer,” Sushma explains. In her 20s, Sushma says she has studied up to Class XII and is working with tribal activists to “revive our lost traditions, songs and skills”. Over the years, she says, there are several of these traditions that have given way to modern practices of the “outsiders”. Asurs, she says, were once iron smelters, but now the village doesn’t have a smelting unit. Chamru says he used to make small weapons, “but I have forgotten all that now”. According to one of the theories, the Magadh Empire benefited a lot from the weapons the Asurs made. “Their iron does not catch rust. And we know there are many Ashokan-era edicts on iron that haven’t rusted,” says Ashwani Kumar Pankaj, a tribal activist in Ranchi. Traditionally, Asurs don’t drink cow milk. “We want the calf to have all the milk and grow up strong so that it can be used in the fields,” says Anil Asur, Sushma’s brother. Villagers still don’t drink much milk or tea, happy instead to down a glass of rice beer. Carron tea estate in West Bengal’s Jalpaiguri district is hundreds of kilometres away from Jharkhand’s Sakhuapani village. It’s here, down a hillock carpeted with emerald-green tea bushes, that Bargi Asur, 83, lives with his family. Reading a Hindi newspaper in the courtyard of his house, Bargi introduces himself as the “oldest resident” of ‘Asur Line’, a colony of about 100 mud and bamboo huts in the tea estate. Bargi says he isn’t surprised that the minister said what she did in Parliament. “She is not the first person to say our beliefs are wrong. For centuries, we have been afraid to talk about them openly. Now we carry out our rituals almost apologetically,” says Bargi, whose son and grandchildren converted to Christianity a few years ago. Bargi himself chose not to convert because he “wouldn’t be able to adjust to a new way of life”. “My two sons and my grandchildren work as tea pickers at the estate. That’s what I have done all my life too. I couldn’t give them a better life, maybe a new faith will bring some light in their lives,” he says. 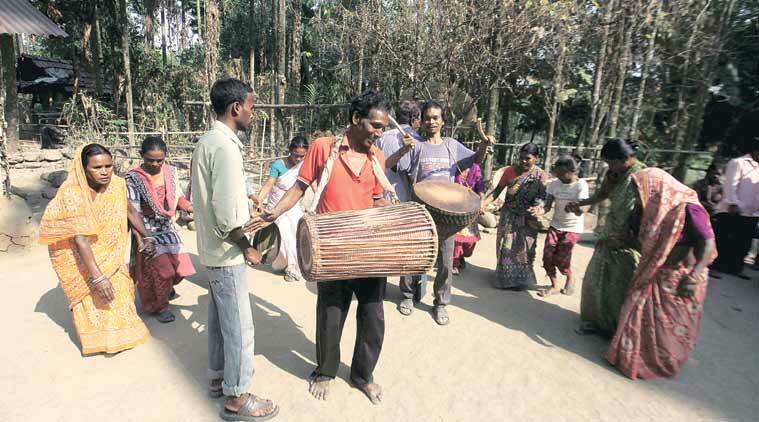 Bargi belongs to a group of about 1,000 Asurs, who moved from Jharkhand and Madhya Pradesh in the early 20th Century and work and live near the tea gardens of Jalpaiguri. “My father moved here in 1914 to work for a British tea planter. We have lived here ever since. It’s been more than a century now,” he says. Jagannath Singh, 67, a social worker who used to work as a primary school teacher at the Carron tea estate school, says the story of the Asurs is like that of most other ‘particularly vulnerable tribal groups’ of the country, but with a “cruel twist”. “Apart from abject poverty, they also have to deal with social stigma. The Asurs in Jalpaiguri were recognised as a Scheduled Tribe only in 2014, after years of struggle,” says Singh. He says that of the 101 Asur families living in Carron tea estate, more than 90 have converted to Christianity. “They have little choice. They feel this new identity will give them a better life,” he says. Yet, some find ways to keep both their new and old identities. “We observe Asur puja twice a year, once during the month of Phagun (March-April) and once during Dusshera. The puja can be performed only by men, and women later participate in a traditional asura dance,” says Etwari Asur, 75. Lalita Asur, 38, who works in the estate and had converted to Christianity about five years ago, says life has taught her to be careful about revealing her true identity. “Why should I claim to be Mahishasur’s descendant? Am I mad?” she laughs. “A lot of us have taken on different surnames such as Topo and Kajur,” says Lalita. 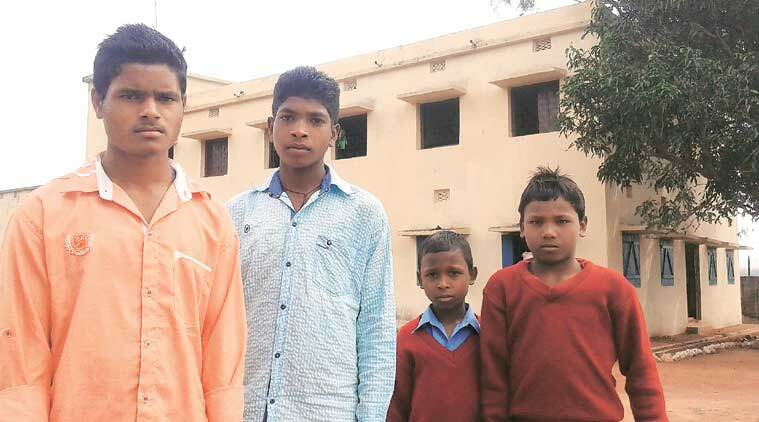 Over the years, the Asurs, both of Jalpaiguri and of Sakhuapani in Jharkhand, have migrated to cities in search of jobs, most youngsters don’t speak the Asuri language any more and their worries are as ‘mainstream’ as any other. The only thing they hold on to are memories — of stories told by their parents, of childhood fears and anxieties. The term tribal defies any universal definition. Between the Maoris of New Zealand, the Aborigines of Australia and the Indigenous People of North America, there is a shared historical fact. They were all there before the colonial powers pushed them to margins. This is not so in the case of all tribal communities in India. 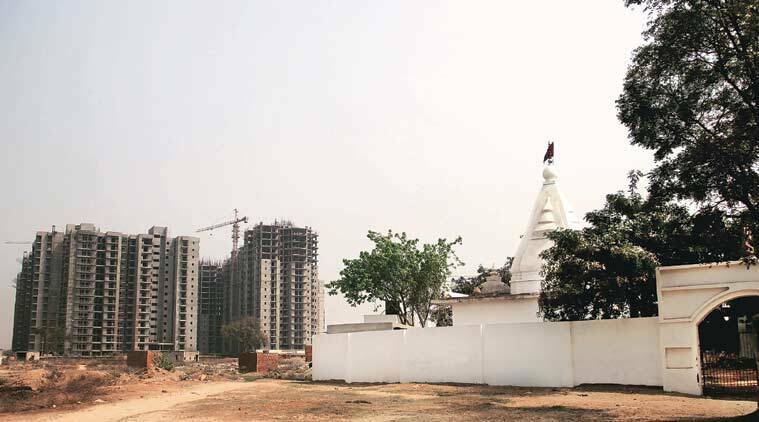 At a half-constructed temple in the village of Bisrakh is a statue of Ravana standing between bags of cement. A car parked outside wears the owner’s identity on its rear windscreen, with stickers of ‘Ravana’ and ‘Gujjar’. 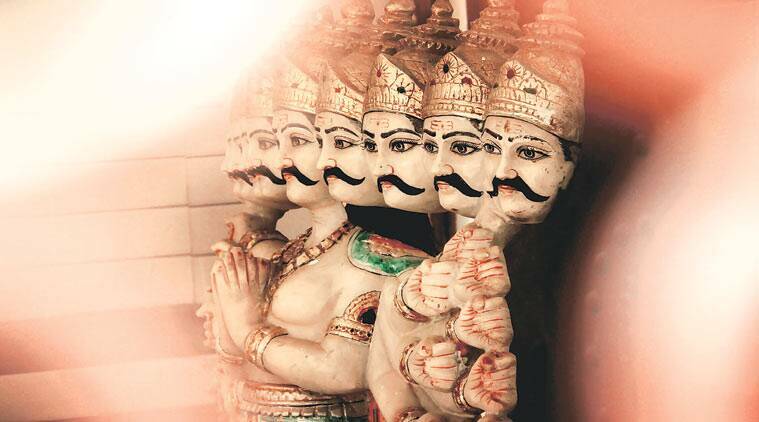 In this Uttar Pradesh village that’s believed to be the birthplace of the ten-headed king, Ravana is not the ‘villain’ of mainstream Hinduism mythology, but a scholar, a kind brother and a devout follower of Shiva.